If you are like us, this summer has been full of barbecues, hikes, sunshine and lots of easy meals. 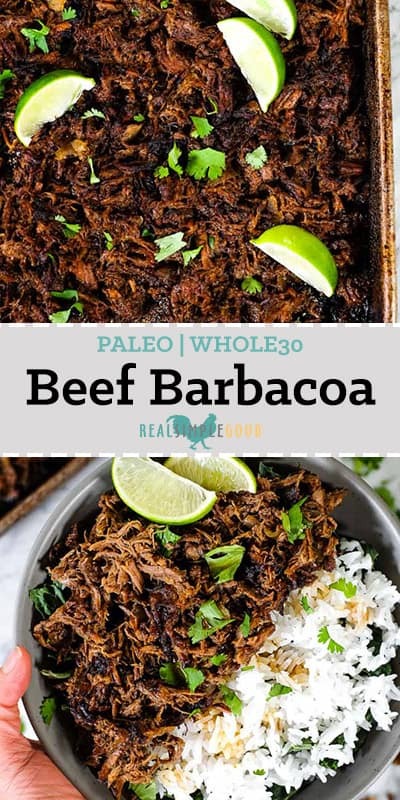 You can make this Paleo + Whole30 beef barbacoa in your Instant Pot or Slow Cooker and save time, energy and extra heat in your house. 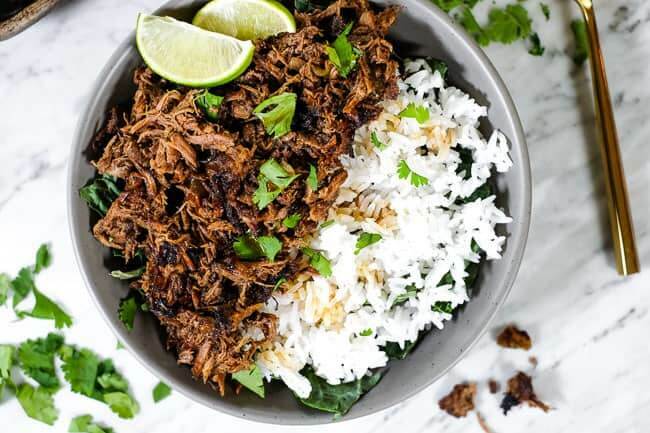 You’ll find yourself craving beef barbacoa for the rest of the summer, making tacos, salads, bowls and more! 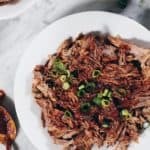 In the recipe below, we give you cooking instructions for both the Instant Pot and a Slow Cooker. Either way there is a little bit of prep work to do. We like to cut our beef into cubes and then brown the outsides in either our Instant Pot or quickly on the stove in a cast iron pan. 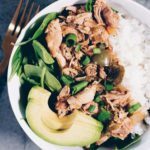 Of course, it is nice if you have an Instant Pot because you can do this step in your Instant Pot and then have no extra dishes to clean up. Either way, it helps to lock in the juices and keep this beef barbacoa tender and moist once shredded! Don’t worry this little bit of effort is way worth it! 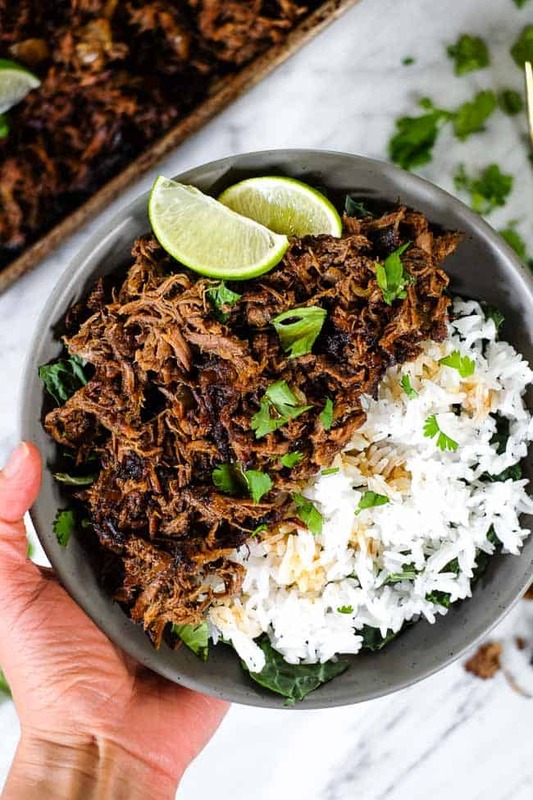 There is something real special about the flavors in this beef barbacoa! It’s a little smoky, with some spice and a hint of citrus. It’s just the right amount of all the things to make you crave it over and over again! You just mix all the juice and seasonings together and then pour the mixture over the beef, onions and garlic. 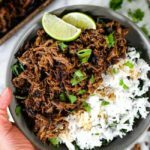 Let your Instant Pot or Slow Cooker do all the hard work melding the flavors together and soaking them into the beef. It is really a tasty combo! 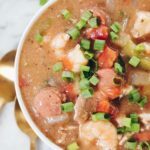 We love this recipe for many reasons including how crazy delicious it is, but we appreciate it because it makes a lot of extra meat that you can use for leftovers and you can enjoy it so many different ways that it never gets old! 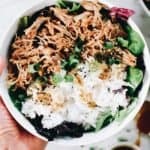 Some of our favorites are in Siete tortillas for tacos, in romaine lettuce shells, over greens and rice for a bowl, add it to a casserole for breakfast, serve it with grilled veggies, etc. The list goes on and we bet you guys can come up with some pretty great ideas too! Let us know what ends up being your favorite! Go ahead and plan this into your upcoming weekend’s meal prep! 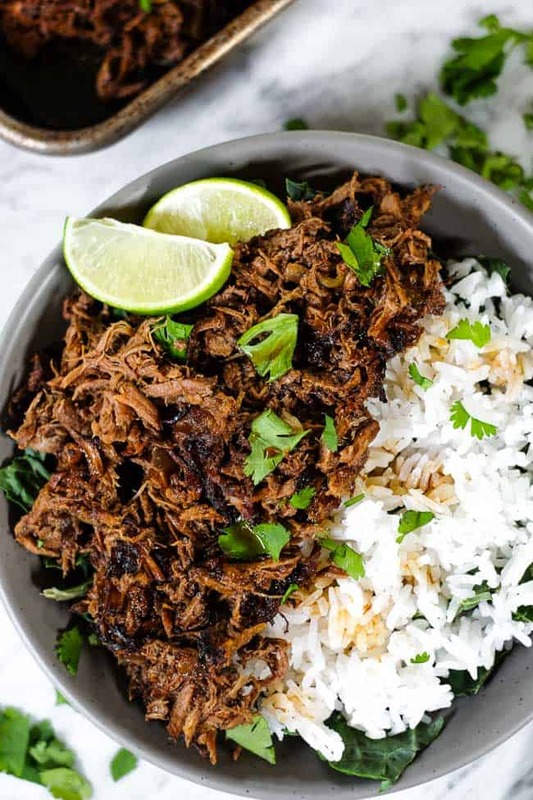 You will love the leftovers and have fun finding the many different ways you can enjoy this beef barbacoa. Leave a comment below to tell us what you think. Take a pic and tag us on Instagram @realsimplegood, so we can see! And if you don’t already follow us on Instagram, we’d love for you to give us a follow so we can stay connected! 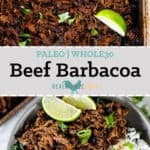 Make this Paleo + Whole30 beef barbacoa in your Instant Pot or Slow Cooker. 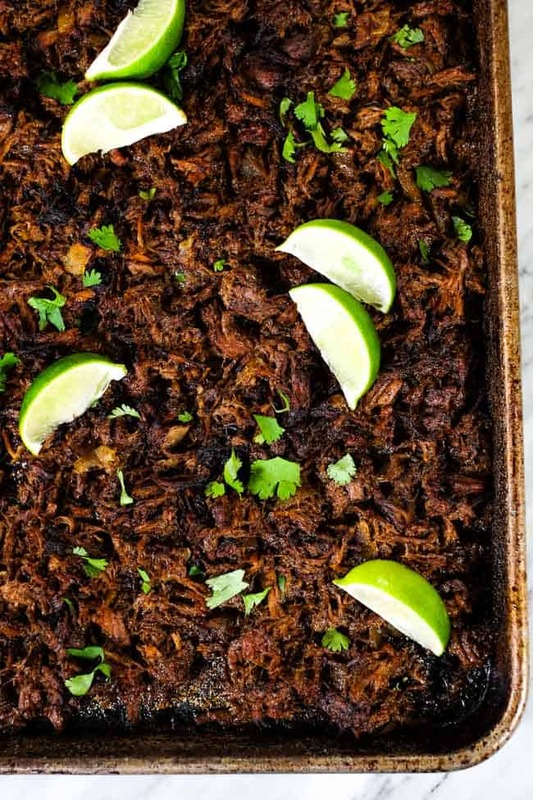 It's a little smoky with some spice and citrus, and it makes lots of leftovers! Cut beef into cubes and set aside. Prep onion and garlic as noted. Combine orange juice, lime juice, vinegar, tomato paste, cumin, chipotle powder, oregano, salt and ground cloves in a bowl or jar and mix well. Press the sauté button on the instant pot and add ghee. Once hot, add in the beef and brown it on all sides. Press cancel on the instant pot once the beef is browned. Add in the diced onion and garlic cloves and pour the juice/seasoning mixture all over everything. Manually release any remaining pressure and remove the lid. Shred the beef with two forks. Serve beef in bowls over greens, in lettuce wedges or in tortillas with your favorite toppings. Heat a large skillet over medium heat and add ghee. Once hot, add in beef cubes to brown, just a minute or so on each side until all sides are browned. Transfer beef to the slow cooker. Cook on low for 8-10 hours. Once the beef is finished, shred it in the slow cooker with two forks and mix it with all the juices. Serve as noted above. 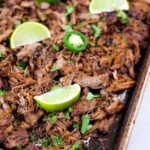 After shredding the beef, use a slotted spoon to remove the beef and onions from the instant pot and place on a large sheet pan. Spoon some of the juices from the instant pot over the top of the beef in the sheet pan. Place in the oven to broil for 6-8 minutes, until the beef begins to develop some brown and crispy edges. Watch carefully and cook to your preference. Alternatively, you can simply transfer some of the beef to a skillet over medium heat and cook it until it's crispy, stirring occasionally. This method is easiest if you are re-heating the leftovers from the fridge. 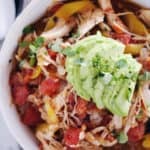 Nutrition facts are an estimate provided for those following a Ketogenic or low-carb diet and do not include topping/serving items for this recipe. See our full nutrition information disclosure here. Amazing recipe! As always your recipe has our friends and family eating the healthy version of the food they love without knowing! Thank you so much!!! Made this recipe yesterday. 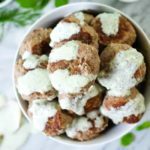 Hands down the BEST recipe I have come across. The dish was packed full of flavor with the right amount of heat. I added some cilantro and avocado when I served it. Thank you for posting such a great and flavorful recipe – we will be adding it to our regular rotation! I made this yesterday and it was FAB! ?? I’m planning on making this for dinner tomorrow and will use left overs for Tuesday dinner. 😊 Do you recommend one way over the other to cook this? Crock pot or pressure cooker? If you have the time I prefer the crockpot because the “low and slow” heat results in very tender meat. 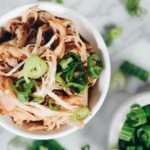 The Instant Pot works well too, you can’t go wrong either way. 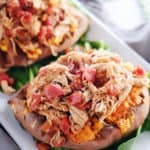 Can you shorten the time by cooking this on high in the crock pot? And if so , how long? We only recommend cooking this on low in the crockpot for the best results and tender meat.